Ariel [AIR-ee-al] is the twelfth of Uranus' moons and is the fourth largest. Ariel was named after a mischievous airy spirit in Shakespeare's play, The Tempest. Ariel was discovered in 1851 by the British astronomer, William Lassell. Nearly everything we now know about this moon was discovered by the Voyager 2 spacecraft in 1986. 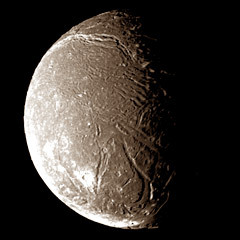 Ariel is believed to be composed of about half water ice and half rocky material. This is a somewhat larger fraction of rock than Saturn's moon, Rhea. Ariel is very similar to Titania, although Titania is about 35% larger. The most striking feature of Ariel is the complex network of deep rift valleys crisscrossing the entire surface of the moon. These canyons are very similar to those on Mars. They have extremely smooth floors, which indicates that they may have been eroded by some form of liquid. We know it could not have been water, because water is as hard as steel at these extremely low temperatures. Astronomers believe that these canyons may have been carved out by liquid ammonia, methane, or carbon monoxide. Ariel is the brightest moon in the Uranian system. 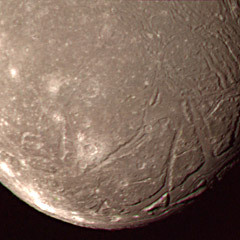 The most prominent feature of Ariel is the network of interconnected rift valleys. They cross the entire surface of the moon for hundreds of miles (or kilometers), and reach depths of 6 miles (10 km). These valleys are similar to those on Titania, but on a much larger scale. 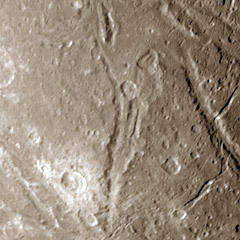 Some of these valleys have ridges, which are believed to have been formed by upwellings of ice from the moon's interior. The surface of Ariel is also littered with craters. Many of these craters appear to be partially submerged. This indicates that the surface is relatively young. Astronomers believe that some sort of process has reshaped the surface of this moon. Ariel has no detectable atmosphere and no magnetic field.